Let me be perfectly clear about one thing from the very start. I have no idea if Representative Joe Wilson of South Carolina is a racist. And in Barack Obama's America, that puts me more or less in a minority of one. Mr Wilson is the person around whom an ugly debate about race and opposition politics has crystallised in this country from the moment he was photographed - looking a little wild-eyed with passion - shouting the words "You Lie!" 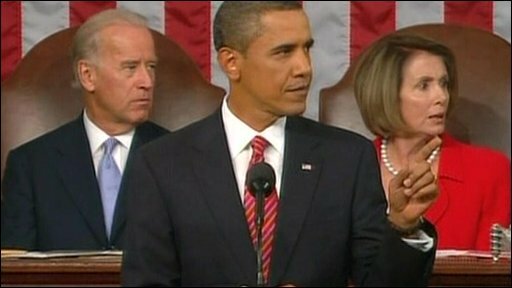 at President Obama during his speech to Congress. It seems to me that only Mr Wilson knows for sure what motivated him. It might have been a serious principled concern at the expansion of government under Barack Obama and the level of borrowing needed to pay for it - it might equally have been simple anger at the idea of living under a black man in the White House. In the angry, febrile atmosphere of modern American politics, though, every pundit and politician worth his or her salt (and quite a few who aren't) find no difficulty in interpreting Mr Wilson's motives with absolute conviction. Columnist Maureen Dowd wrote of "hearing" the unspoken word "boy" on the end of Mr Wilson's phrase - in American racial politics a belittling epithet that reeks of the cotton-field and the slaver's plantation. Nothing could have summed up more vividly and chillingly the context in which many liberals see the Wilson outburst. Here, they argue, was something that went beyond the disrespect of the president's office implied by mere heckling. Here was something that implied to anyone who knows the codes and tones of American politics a contemptuous sense of racial superiority over the commander-in-chief. As far as this debate goes, Mr Wilson has littered his path to public service with hostages to fortune. He worked for segregationist politician Strom Thurmond who once boasted that there were not enough troops in the American Army to force white southerners to share theatres and swimming pools with blacks. And he was part of a political rearguard that tried to stop the state of South Carolina removing the flag of the old confederacy from the top of its capitol building. Some southern whites see the "Stars and Bars" as an honourable relic of a noble cause - just about all African-Americans see it as an ugly and offensive relic of slavery. The Wilson family have been swiftly deployed to counter the impression left by that CV. The congressman's son says "there is not a racist bone in my dad's body" and his wife is now appearing in a political ad on TV talking about how she had rung him after the Obama speech to ask who had interrupted the president. The point being, of course, that it never occurred to her that it would be him. Former President Jimmy Carter raised the whole debate to a new level of seriousness by arguing in an interview with NBC TV that an "overwhelming proportion" of the hostility directed at Mr Obama is based simply on the fact that he is a black man. 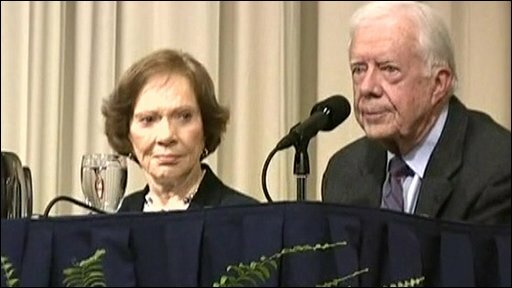 Jimmy Carter: "There is an inherent feeling among many in this country that an African-American should not be president"
Mr Carter is no stranger to making remarks that his successors in the White House will find unhelpful - remember his suggestion that it is time for America to start talking to Hamas? But this in particular is a suggestion from which the White House would run a mile. During the presidential campaign Mr Obama and his aides worked tirelessly to ensure that his victory was not portrayed as a racially polarising reckoning with the past - a kind of payback for the black community after centuries of oppression and disadvantage. The last thing the administration wants to do now is create the impression that it views nearly all opposition to its plans as racist - that would be tantamount to arguing that no decent person could possibly disagree with the government's healthcare plans, hardly a winning strategy in a democracy. Mr Carter's words were presumably directed at the nastier fringe of the people who do not like Mr Obama - like the angry fringe who carry posters of him dressed up as an African witch-doctor or persist in the hopeless belief that they can somehow "prove" he was not born in the US and that therefore, somehow, he cannot really be president. But on the right, there are plenty of people who insist that those protesters are uncomfortable with Mr Obama purely because they see him as a big-government liberal, not because he is black. Proving anything one way or the other in this sort of debate in America is extraordinarily difficult. Racism and the responses to it are conveyed in code at least on the public stage here and attaching motives to what people do and say is never easy. Perceptions depend as much on the prejudices of the accuser as they do on the prejudice of the accused. But in the end, the point is this. It does not really matter whether Joe Wilson is really a racist or not. Whatever his motives, his words are a brutal reminder that the election of Barack Obama did not usher in a new age of post-racial politics in the US if anyone was naive enough to think that it might. And if history is any judge, you need not worry about Mr Wilson's prospects of re-election, by the way. South Carolina was traditionally a place apart in such matters. In 1856, a pro-slavery representative from the state called Preston Brooks took a gold-tipped cane and beat the abolitionist Senator Charles Sumner half-to-death while an accomplice held off any would-be rescuers with a firearm. Mr Brooks of course, was forced to resign his seat, but when fresh elections were held, his constituents simply re-elected him and sent him back to Washington.